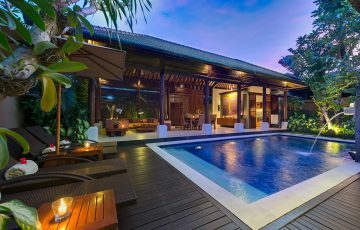 From $ 317 $ 271AUD per night We have direct contracts with most villa owners. We don't add any booking fees. We are 100% transparent with no nasty surprises. 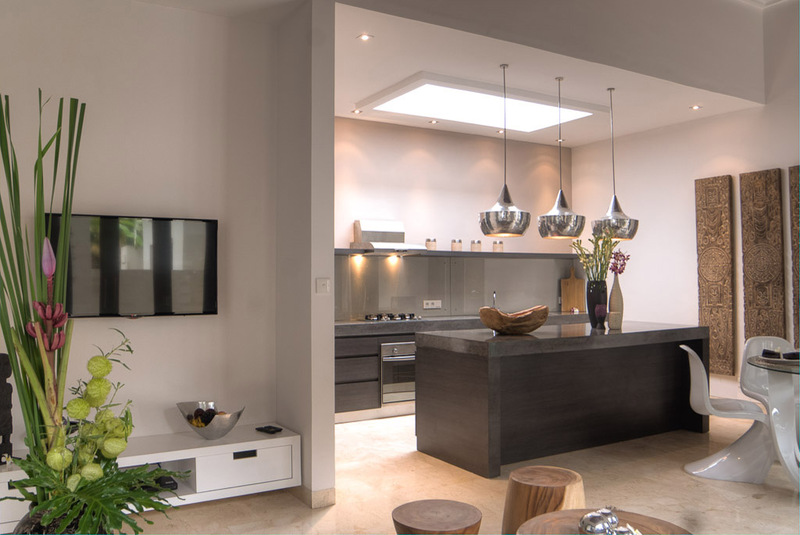 Fabulous and very central location – you are literally in the heart of Seminyak ideal for being close to all the best restaurants, bars, cafes & shops on Eat St, Petitenget & Oberoi area. 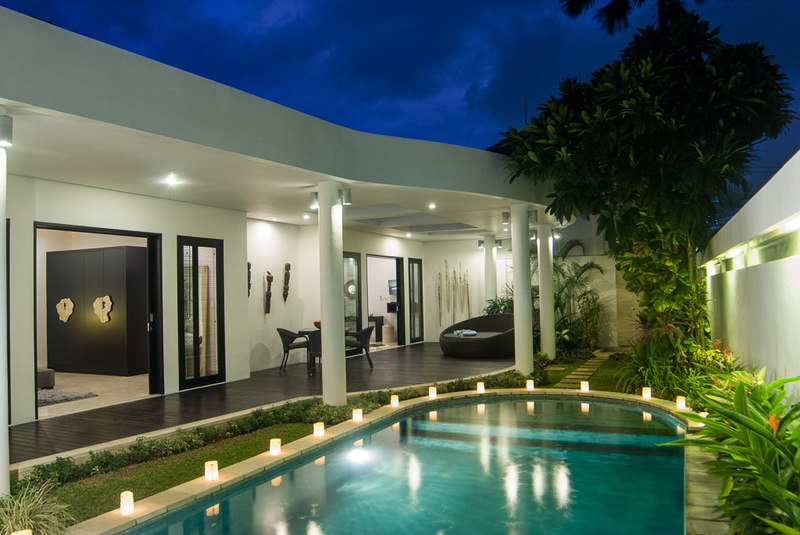 Villa Lanai is a 2 bedroom Seminyak holiday villa rental & offers a wonderful central Seminyak location, the five star services of a professionally managed private villa estate and 24-hour gated security. 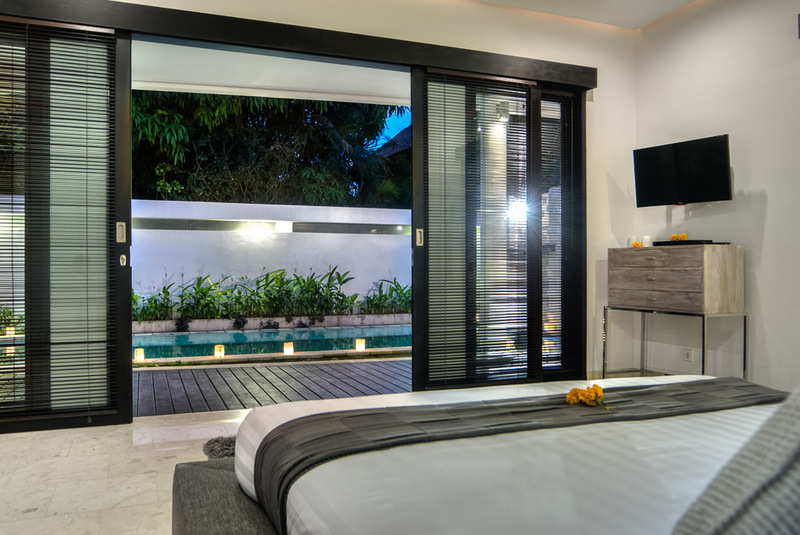 From the villa you can walk to Seminyak’s most popular tourist area; Eat Street and within 15 minutes the beach at the popular Potato Head & Ku de ta Beach Club. 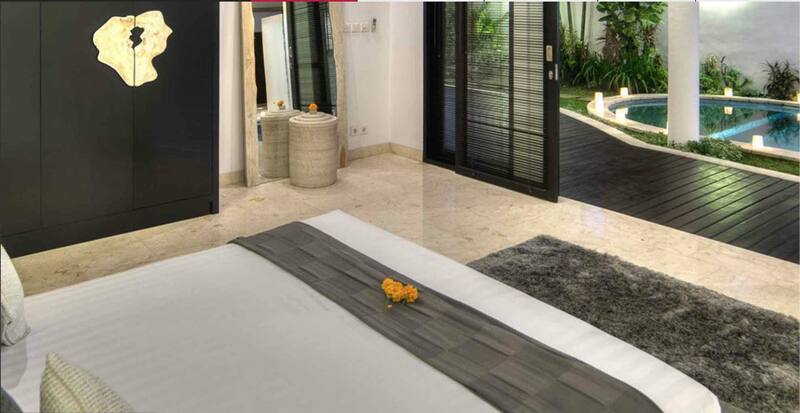 The villa was recently renovated and its make over has transformed it into luxurious modern holiday villa for up to 4 lucky guests. Even though you’re just a short stroll to Eat Street, once your within the high walls of Villa Lanai you will experience complete peace and privacy. 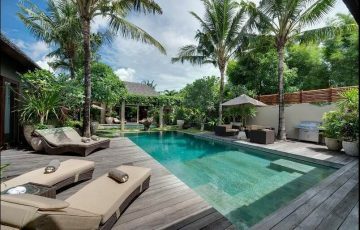 The garden is mostly taken up by the pools crystal clear waters with a water feature at one end, adding a touch of Bali zen. By the pool, a covered timber patio provides a chic daybed for you to relax after a refreshing swim and an outdoor setting for 4 to enjoy meals outside during the day. 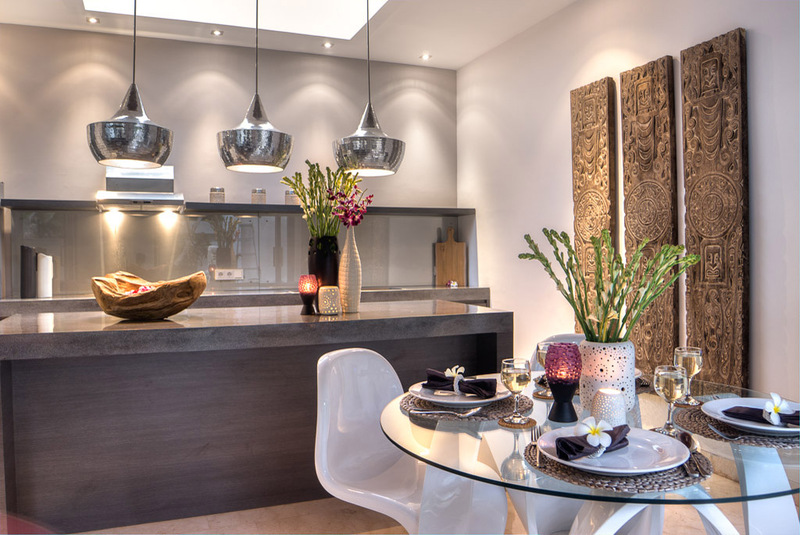 The kitchen, lounge and dining areas are open-plan with chic and ultra-stylish furnishings throughout. 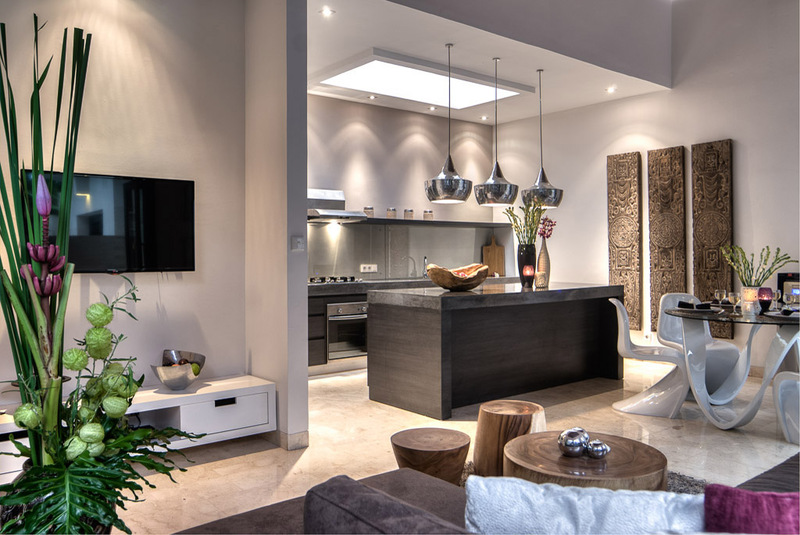 An L-shaped suede lounge is positioned in front of a wall mounted plasma TV, the circular glass dining table with its designer white chairs, ideal for a formal dinner, sits adjacent to the european styled kitchen with all the latest appliances. 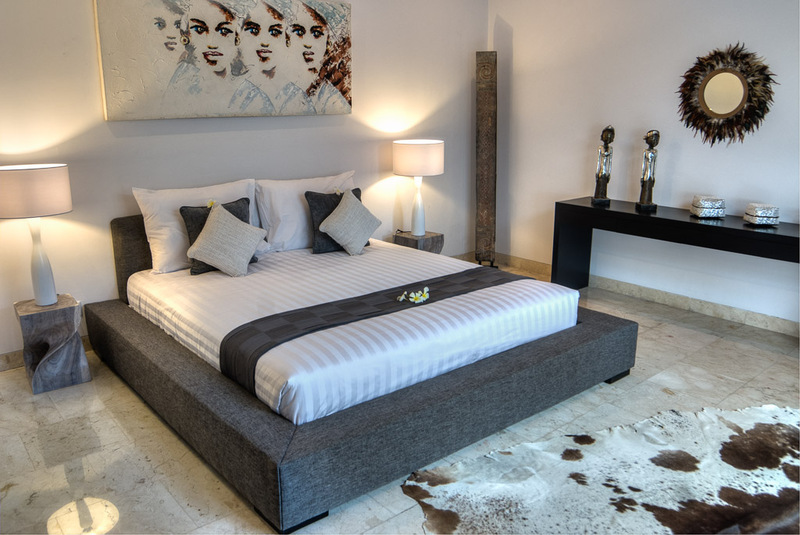 Both bedrooms make sure all guests will sleep in comfort with king size beds and private en-suite bathrooms. 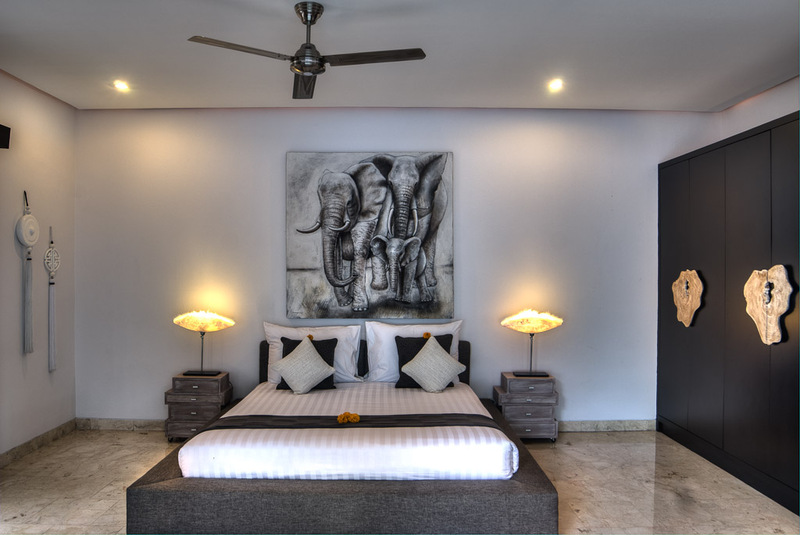 The rooms are air-conditioned and boast 46” plasma TV’s with DVD and cable channels. 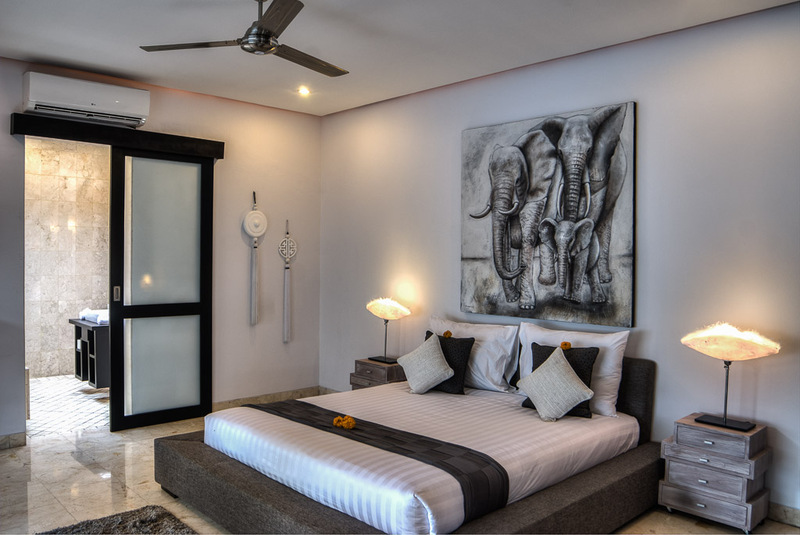 Hues of grey, black and white dominate the decor of both rooms, vibrant wall art and decorative ornaments blend perfectly. 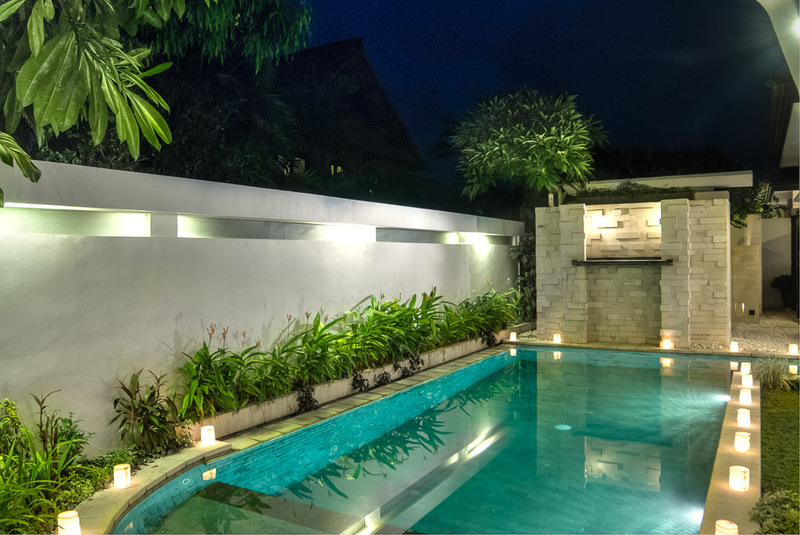 The complex is serviced by a professionally trained team of warm and welcoming Balinese staff. 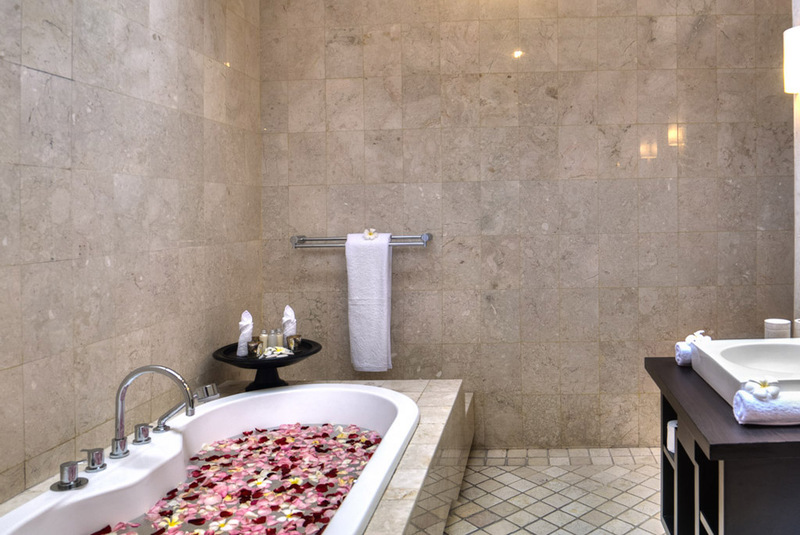 The 24-hour front desk is very convenient, at any time you can order catering, book a taxi or request the services of a babysitter or maybe in-house spa services. 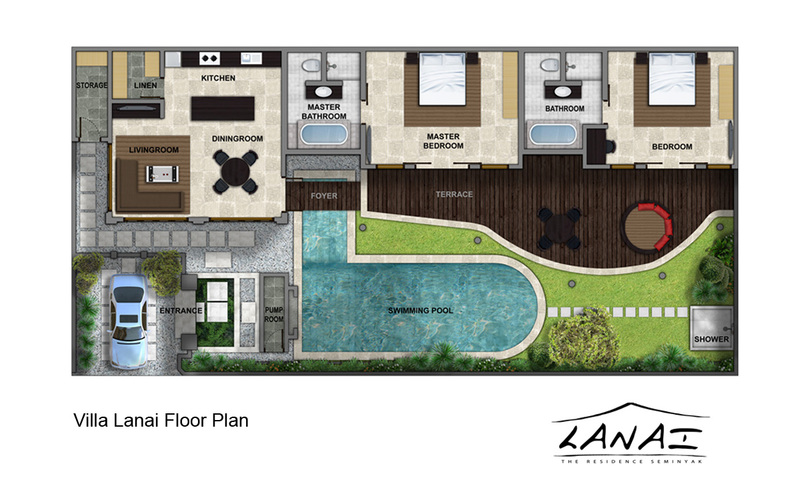 Villa Lanai is located along Jalan Mertasari just a 5 min walk to Jalan Oberoi. 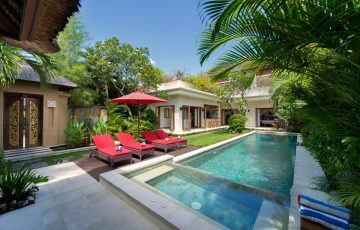 From the villa Seminyak Square is nearby with a great supermarket where you can stock up on all your holiday goodies, snacks, food and alcohol, shops of all description, ice cream shops for the kiddies and ATM’s. You can easily walk to the beach as well, along the way passing popular eateries such as Sisterfields, Motel Mexicola and once on the sand you will discover La Luciola, a wonderful restaurant for breakfast, lunch and dinner. If your coming with he kids then Waterbom Park & Finns Recreation Club (waterslides, ten pin bowling & trampolines) are all a short taxi ride away. 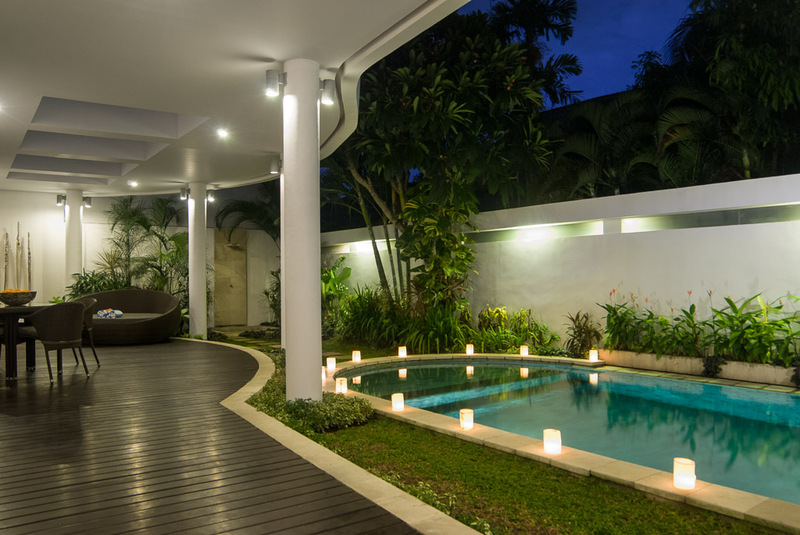 Villa Lanai is the perfect villa is you want to experience all the excitement that Seminyak has to offer. 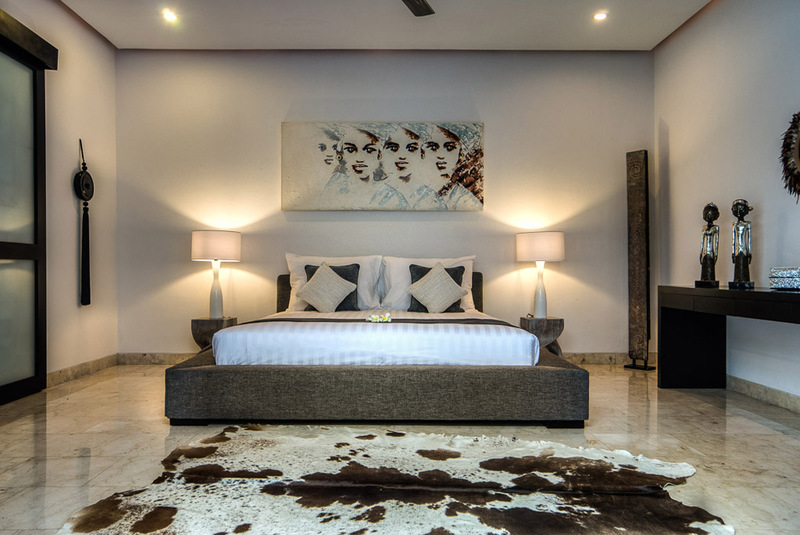 To view other Seminyak villas with breakfast included or our full range of Bali villas near Eat Street to rent please browse this website or contact our reservation team. 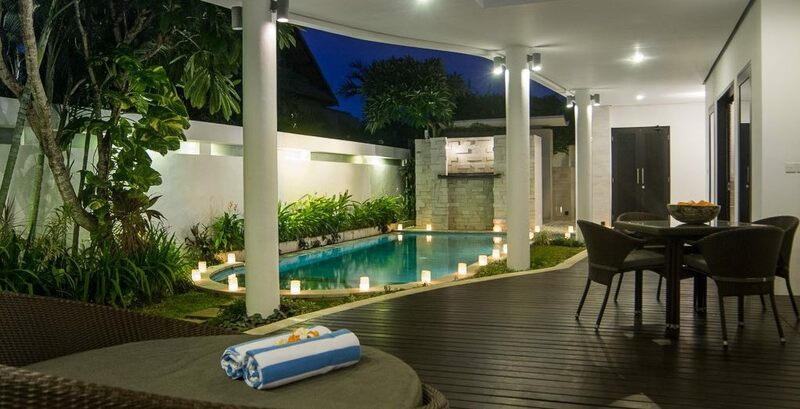 This is a popular Seminyak holiday villa rental so if your planning a trip to Bali, especially during the Australian school or public holidays please book Villa Lanai well ahead. 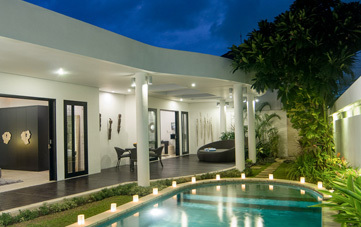 Villa Lanai was great value considering the price, loaction and level of service. The location was so central and we could walk to everything, especially all those great restaurants at night which were so close by. It was quiet ( considering the central location), very private and clean, ....the family loved the villa. The staff were unbelievably friendly, helpful and always on time with our morning breakfasts - huge thanks to Ina and Yayuk at Bali Villa Escapes for organising this so quickly - we will be back! We spent a week here with our 2 children ( they shared a room) and had a fantastic time. 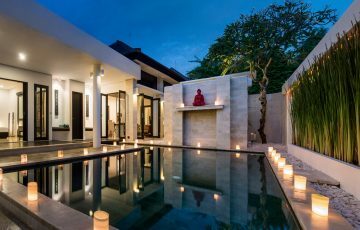 We were after a villa that had 24 hour security that was also close to all the restaurants as well as kids entertainment & the team at Bali Villa Escapes recommended this epic villa based on our nighty budget. All we can say is WOW - it ticked all the right boxes and we just loved every moment on this holiday. Staff, the rooms, pool and of course the location were a big 10 out of 10! 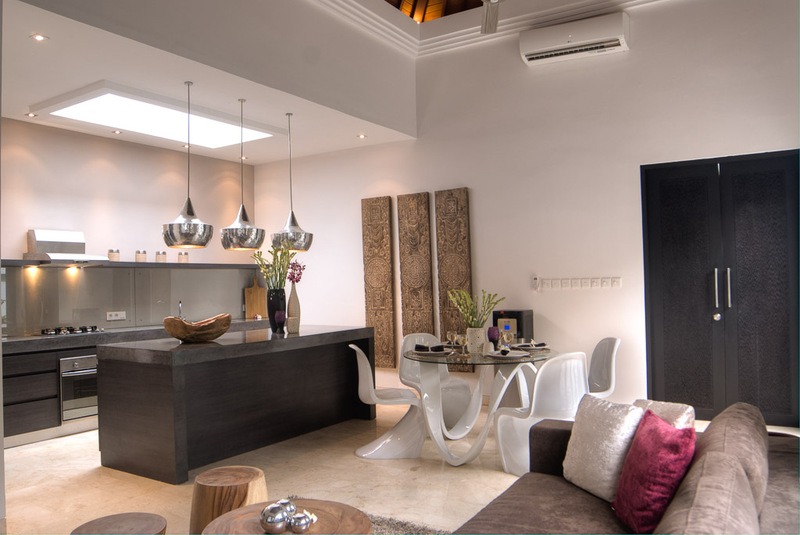 We wanted a villa in a central location and chose Lanai because it was close to "Eat St' in Seminyak. We wanted to be able to take the kids out at nights without going too far. 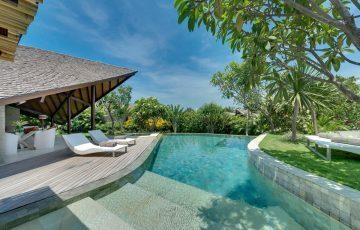 The villa was perfect and we loved the whole atmosphere especially the pool area which had a great wooden deck to relax on as well as lovely tropical gardens. The staff were amazing and cooked the most tasty breakfasts for us every morning which was a highlight. This was our first trip to Bali as well as staying in a villa and we cannot wait to do it all again. Perfect location, amazing staff and reasonably priced. This is a real gem of a find and I can only say that I am more than happy to recommend this villa. Lanai is fabulous! Thanks to everyone for making this one of our best family holidays ever. We are already making plans for a return trip. This was our second time staying at Villa Lanai and there will be a third. We love it here.